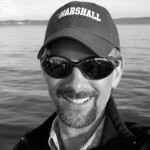 Dr. Brian A. Hoey received his Ph.D. in Anthropology from the University of Michigan. His research has encompassed broad range of interconnecting themes that include personhood and place, migration, narrative identity and life-transition, community building, and negotiations between work, family, and self in different social, historical, and environmental contexts. Longstanding interests in career change, personal identity and the moral meanings of work lead to his project as a postdoctoral fellow at the Alfred P. Sloan Center for Ethnography of Everyday Life on “New Work,” unconventional arrangements of work, family and community life explored by so-called free-agents of the post-industrial economy. His dissertation research in Northwest Lower Michigan explored non-economic or “life-style” migration where downsized and downshifting corporate workers relocate as a means of starting over. As a Fulbright Scholar in Indonesia, he studied the contested nature of constructing personally and culturally meaningful space within the process of creating imagined and intentional community in far-flung agrarian settlements within a government migration program. He has also explored how therapeutic ideals are attached to particular physical settings–including purposive communities that range from 19th century moral treatment asylums to today’s New Urbanist developments. Hoey continues his work with migration, community development, and economic restructuring–focusing now on the Appalachian region of the United States. 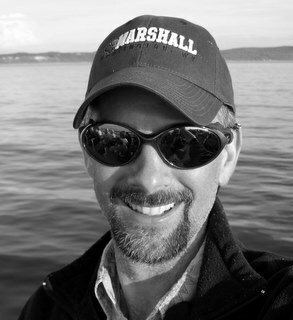 Despite a recent history of often bleak economic conditions and an continued mixed prospects, He has found the communities surrounding Marshall University are, in many ways, perfect places to conduct research on new forms of work, entrepreneurship, community building, and the marketing of place according to emerging cultural and economic models that may stand in sharp contrast to the dominant order of the Industrial Era. In an area where plant closings and grim economic forecasts became commonplace over the past several decades, innovation which challenges conventional wisdom should not surprise us. Innovation is often born of necessity. We can see this kind of innovation right here at Marshall University where tight budgets necessitate strategic planning to clarify the University’s place and purpose in higher education and economic development in the state and region. Most recently, Hoey has deepened his research into human health as affected by environmental factors that include urban and regional planning, environmental policy, and the lived experience of toxic contamination. Hoey’s active research agenda is an integral part of teaching. His goal is to work with students to find personally meaningful ways to apply anthropological knowledge and practice to real world problems. You may learn more about his work at www.brianhoey.com. 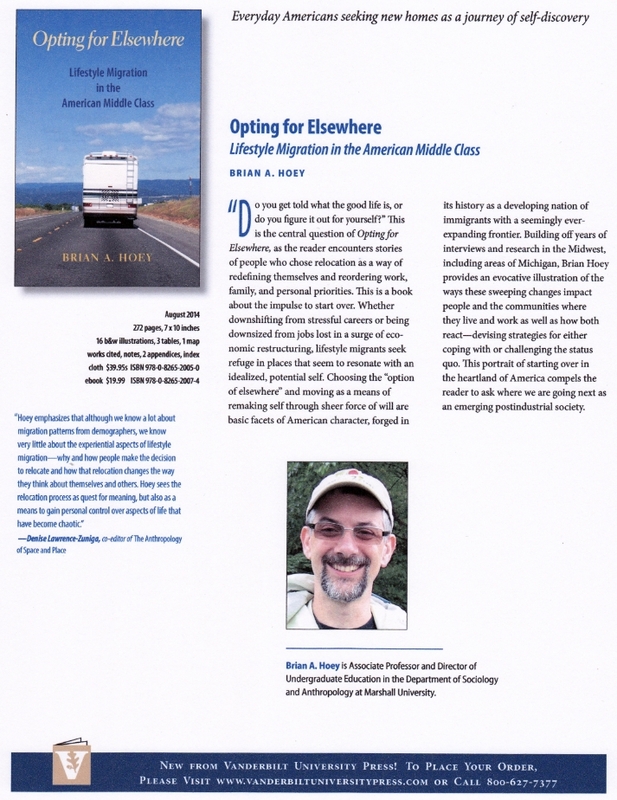 2014 Opting for Elsewhere: Lifestyle Migration in the American Middle Class. Nashville, TN: Vanderbilt University Press. 2015 “Capitalizing on Distinctiveness: Creating WV for a New Economy,” Journal of Appalachian Studies Vol. 21(2): 64-85. 2010 “Locating Personhood and Place in the Commodity Landscape,” City and Society Vol. 22(2): 207-210. 2010 “Personhood in Place: Personal and Local Character for Sustainable Narrative of Self” City and Society Vol. 22(2): 237-261. 2007 “From Sweet Potatoes to God Almighty: Roy Rappaport on Being a Hedgehog” [with Tom Fricke] American Ethnologist Vol. 34(3):581-599. 2015 “Creating Healthy Community in the Postindustrial City” in Recovery, Renewal, Reclaiming Anthropological Research Towards Healing, L. King, ed. Knoxville: University of Tennessee Newfound Press, pp. 6-44. 2015 “Post-Industrial Societies” in International Encyclopedia of the Social & Behavioral Sciences (2nd edition, Vol. 18), James Wright, Ed. Oxford: Elsevier, pp. 663-669. 2014 “Theorizing the ‘Fifth Migration’ in the United States: Understanding Lifestyle Migration from an Integrated Approach” in Understanding Lifestyle Migration: Theorizing Approaches to Migration and the Quest for a Better Way of Life, Benson and Osbaldiston, Eds. Hampshire: Palgrave, pp. 781-91. 2013 “Roy Rappaport” in Theory in Social and Cultural Anthropology, J. McGee and R. Warms, Eds. Sage, pp. 685-688. 2009 “Pursuing the Good Life: American Narratives of Travel and a Search for Refuge” in Lifestyle Migration: Expectations, Aspirations and Experiences, K. O’Reilly and M. Benson, eds. London: Ashgate, pp. 31-50. 2008 “American Dreaming: Refugees from Corporate Work Seek the Good Life” in The Changing Landscape of Work and Family in the American Middle Class, E. Rudd and L. Descartes, eds. Lanham, MD: Lexington, pp. 117-139. 2007 “Therapeutic Uses of Place in the Intentional Space of Purposive Community” in Therapeutic Landscapes: Advances and Applications, A. Williams, ed. London: Ashgate, pp. 297-314. Find copies and links to my work at Academia.edu. Taking an intellectual risk, that is, a willingness to challenge oneself to think differently about the world, is at the root of a Liberal Arts & Science Education. Learn more about the case for the necessity of such an education for a prosperous future in the American Association of Colleges and Universities report titled Making the Case for Liberal Education: Responding to Challenges.